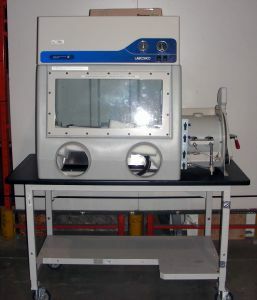 Product Description This Labconco 52201-00 Precise Controlled Atmosphere Glove Box is reportedly in excellent condition and is just no longer required by the seller. Chamber Dimensions: 11 x 12"
FROM MANUFACTURER'S LITERATURE: Designed to provide a leak-tight environment for work with contamination-sensitive materials. The unit features a dry powder, epoxy-coated steel superstructure; 0.6cm (1/4") thick laminated safety glass viewing window with powder-coated steel frame and neoprene gasket; and molded one-piece, medium-density, polyethylene shell. The cutout area is 26.5 x12.5"H, and the window can be easily removed for loading equipment. The space-saving inner and outer transfer chamber doors pivot upward and are counterbalanced and equipped with quick latches. The black, chemical-resistant phenolic core work surface is sealed to the glove box floor. Glove box includes a pressure relief valve that activates at pressure/vacuum above 15.2cm (6") or below -15.2cm (-6") of water gauge. The pressure relief valve vent has a 10.2cm (4") nominal diameter. Unit has an interior ceiling-mounted electrical duplex receptacle with 5A maximum (100/115V model) or 2A maximum (230V model) circuit load, and includes switches for the light and innermost interior electrical receptacle. Glove box is factory leak tested with a mass spectrometer while pressurized with helium at 12.7cm (5") of water gauge. No detectable leaks greater than 1x10-4 mL/sec. WHEN NEW, the unit is performance tested to maintain less than 5ppm oxygen levels and less than 50ppm moisture levels. Features six manual valves with 0.95cm (3/8") compression fittings and hose barbs. Two valves on the main chamber and two on the transfer chamber are for purging and filling. The other two on the main chamber are for drying connections. The main chamber has a pressure gauge with readings from -12.7 to 12.7cm (-5 to 5") of water gauge. The transfer chamber has a pressure gauge with readings from -73.7 to 0cm (-29 to 0") of mercury. Glove box meets Class 1 atmosphere containment conditions for oxygen leak rates per ISO 10648-2 test method. Gloves and other consumables are available at additional cost. Table shown in photo is included. Vacuum pump not included. **This is being sold on consignment (it's in our warehouse, but we are selling it on behalf of its current owner). Upon receipt, you will have 30 days to test the unit and return it for full refund (less all shipping charges) if you find it to be functionally defective.